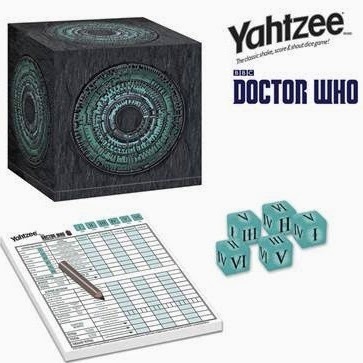 Comic-Con 2014: Get Your Exclusive Doctor Who YAHTZEE Game at San Diego Comic-Con! 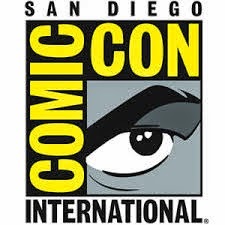 YAHTZEE: Doctor Who Pandorica Edition lands exclusively at the Comic-Con International: San Diego 2014 convention this July. Produced by USAopoly, under license from Hasbro, Inc. and BBC Worldwide North America, the Pandorica Edition YAHTZEE game allows fans to recall the iconic Doctor Who fifth series finale, which introduced the mysterious chamber hidden under Stonehenge, while rolling classic dice combinations such as a Full House and Large Straight. 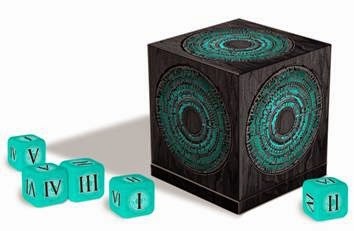 This game comes complete with a Pandorica stylized box that serves as a dice shaker, custom Roman numeral translucent dice, score pad, pencil and instructions. Supplies won’t last, however – this is a special edition item fans won’t want to miss. “We are very excited about this collaboration and we believe this exclusive game is a perfect fit for Doctor Who fans,” says John M. Davis, President, USAopoly, Inc.
YAHTZEE: Doctor Who Pandorica Edition will only be sold at Comic-Con International: San Diego 2014 convention, available exclusively in the BBC AMERICA booth (#4129) on preview night, and then in the BBC America booth and the USAopoly booth (#1017) for the rest of the convention. It will retail for $20.00 (limit two per customer).